While there was no shortage of important news stories on Vancouver Island in 2017, there were also a few stories that warmed our hearts or made us laugh. We've asked CTV Vancouver Island reporters to recap some of the stories that brought a smile to their faces this year. "Looking back on my coverage of 2017 there was once again a wide variety of stories, from the middle to the northern tip of this large island of ours. There was everything from people's exhilarating encounters with wildlife to the terrible rail tragedy that struck the community of Woss. Picking one is difficult but I'd have to say one of the most memorable was a visit I made to a couple living on a remote man-made island off of Tofino. Their Freedom Cove home is serving as an inspiration to others from around the world to live out your dream." "A hockey mom put out the call on Twitter for some help putting together a Peewee team’s video submission for the Hockey on the Hill contest. Winning entries get an all-expense paid trip to Ottawa to play in a tournament on the Canada 150 rink on Parliament Hill. I answered the tweet and the kids were super excited to take part. Keep in mind these aren’t hockey prodigies, and their team was winless in 10 games at the time of the story. These kids play ‘C’ division house league hockey because it’s fun. Their excitement carried over into the video and subsequent story, and they won the contest, giving them the right to represent BC on Parliament Hill." "The story that resonated with me the most this year is about a brave boy who's overcoming overwhelming obstacles and expresses his love in the most raw and genuine way. We first met seven-year-old Asher in March, when we learned that he’s a huge, and I mean HUGE, fan of indie pop duo Tegan and Sara. He’s also a huge fan of his Mom. After his story aired, Tegan and Sara’s management saw it and invited Asher to meet his idols in Victoria, while they were performing at the Canada 150 celebrations. So, naturally, a second story followed. Asher was one of the beaming lights of 2017." "Choosing your favourite story is like picking your preferred child – you can’t do it. We’ve met too many remarkable people during our random search for Sign-Offs, who’ve shared too many unforgettable stories, to recognize just one. Instead – how about the most unusual story we found? It ended-up being broadcast nationally, before being picked-up by media around the world from Brooklyn to Bangladesh. It all began while searching for a Sign-Off around Metchosin. We stopped to ask a woman walking a goat on a leash if she knew anybody with a great story. She answered, 'You could try my neighbour. He has a peacock that’s in love with a turkey.'" "When I asked Adam Sawatsky, years ago on air, if he had ever seen the popular film I never imagined it would turn into “a thing.” I was shocked though. How could an Arts and Entertainment Anchor, who prides himself in knowing the ins and outs of the entertainment world, not know about Andy Dufresne and his (spoiler alert) escape from Shawshank? In late March, after years of prodding, my persistence paid off." "When looking back at our most watched stories of the year online, you can almost always predict what, or who, will be #1. It won’t be a political bombshell. It won’t involve a fire, or a deadly car crash. There sometimes aren’t any people in it, at all. Animals, whether we like it or not, have become the bread and butter of local newscasts, especially online. And this year, our most watched story does not disappoint in that department. Jordan Cote shot the video, in his Sooke backyard. 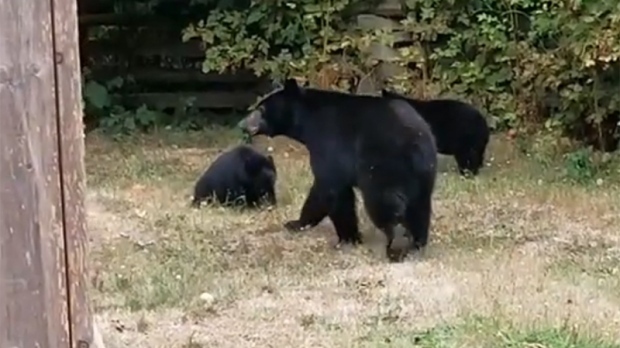 It is perhaps the most polite bear encounter in Vancouver Island history. And in case you’d like a second helping, here it is. Enjoy." Click here for part one, a look at the "newsier" stories of the year.